Melanin-containing powders and their aqueous solutions have been studied by electron spin resonance (ESR). 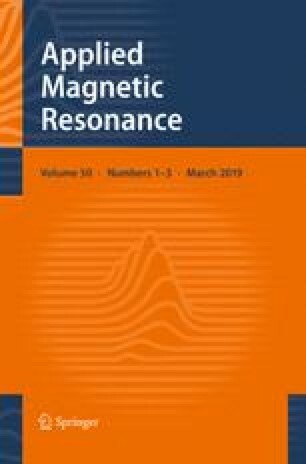 Lorentzian lineshape, temperature dependence of magnetic susceptibility and linewidth resemble those for conducting polymers in which polyconjugated chemical links between their paramagnetic centers play an important role. Aqueous solution of one powder has been studied by the spin-probe method. It has been found that the addition of probes Fe(CN) 6 3− does not affect substantially both the width and the amplitude of melanin ESR lines probably due to strong electrostatic repulsion between the probes and negatively charged surrounding of melanin. The addition of probes Co2+ decreases the amplitude of melanin ESR line and does not affect its width. This may be explained by adsorption of the probes on negatively charged sites in the vicinity of melanin paramagnetic centers.